Varsity is special. Described by many as impossible to fully understand until it has been experienced, the cross-country version of this ancient rivalry is no exception and the Blues races are the centrepiece of a day overflowing with history, tradition and nostalgia. From pre-race suits to complex spectating routes, photos with red flowers to pink-vest-wearing Bowers, and muddy water splashing to late night drunken flashing, there are countless quirks associated with the event. 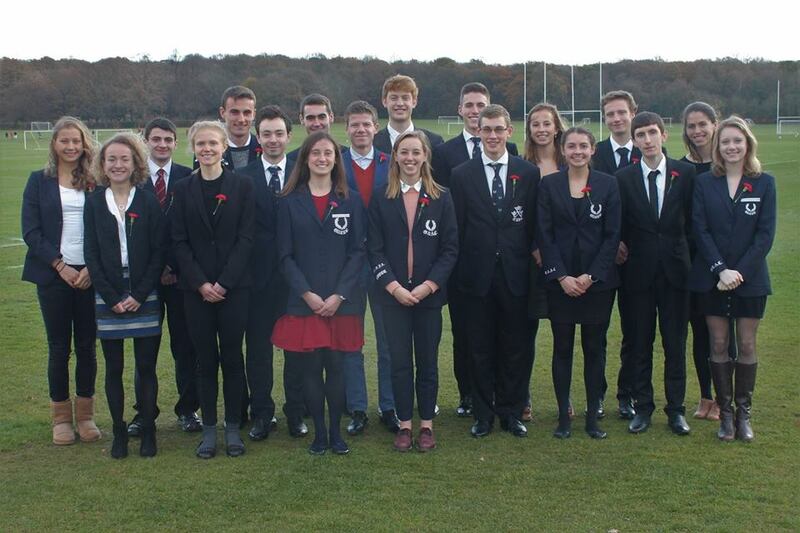 As Bethanie explained to this year’s freshers on the eve of their Varsity debuts, “If you have a confused question about tomorrow, the answer is probably tradition”. We piled onto the coach at half past nine with the Blues and reserves suitably dressed up in outfit one of three for the day, and after a short delay the musical entertainment began. The ‘pump up playlist’ is a well-established coach ritual, designed to do as the name suggests and ensure everybody is suitably hyped on arrival. First up was Two Door Cinema Club, of course, followed by various other classics including a new favourite of LC’s featuring an Italian dessert. Other key track-listings were the PG rated “Fresher Prince Drop Bear”, an out-of-this-world performance of “Dan Fix You Mulryan”, a horrendously stereotypical reminder that Eoghan will in fact never run for the seconds, and one tune that has no doubt been stuck in everyone’s heads getting stronger since that very first rendition. Amongst all of the karaoke excitement we made considerably faster progress towards our destination than we had done twelve months earlier, and in no time at all had left Archie’s bridge far behind us. French plaiting manoeuvres were conducted with their usual elegance, ribbons were distributed to runners and supporters alike, and Helene’s pink carnations were vetoed in favour of the, you guessed it, traditional red variety. 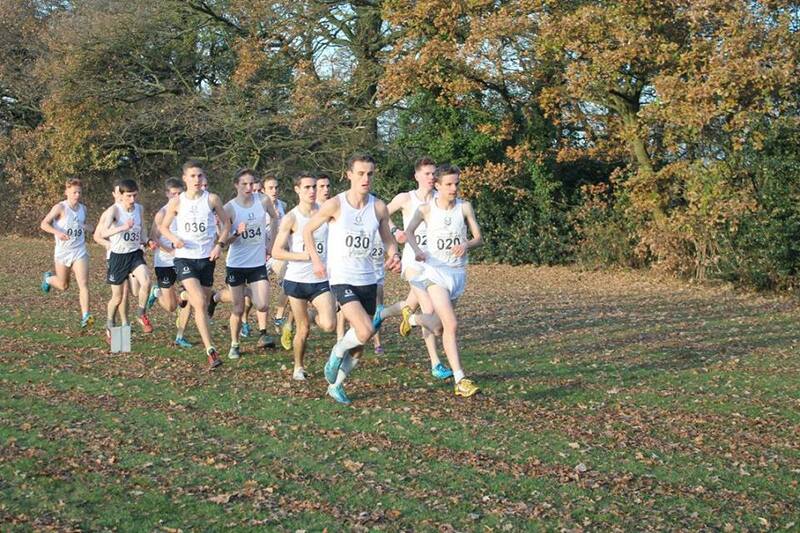 The first cross-country action of the day was the 25th Old Blues Race. 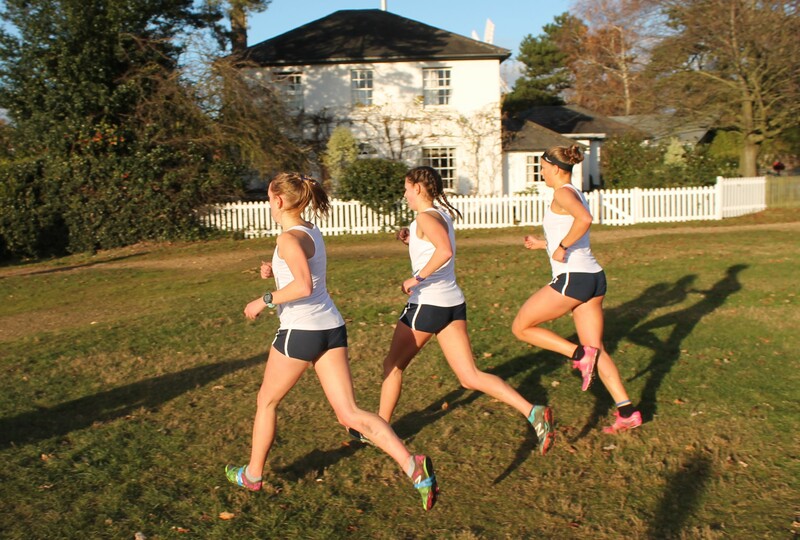 Held alongside the Varsity races every year, this follows the women’s course and participants include recent Blues seeking revenge on old rivals, slightly less recent Blues who just can’t let go, and current Oxbridge students guest running because, well, why not? The former was the case for this year’s leading duo as Tom Frith (Oxford) took the win from Lewis Lloyd (Cambridge) and in doing so reversed the 2013 Men’s Blues result. A strong showing from Cambridge meant they took the overall victory. At two o’clock Polly Keen, celebrating ten years since her individual victory as a fresher, gave the starting signal for the 41st Ladies’ Race and fourteen white vests set off in search of similar success. By the time they reached the windmill Sophia Saller, Bethanie Murray and Dani Chattenton looked comfortable running side by side in a fine display of dark blue dominance at the front of the race. Lizzie Apsley (Cambridge) ran well in a heavily outnumbered scenario to cling on for as long as possible, but by the time she reached the woods she had been decisively distanced. Feeling confident that they had secured an Oxford 1-2-3 but with no idea what was going on behind, all that was left for the leading trio to do was determine a finishing order. As they emerged from the woods and onto the memorial playing fields for the yet-to-be-named “Blues finish – who wants it?” run in to the line, it was Sophia who took the lead from Bethanie in a bid to prove that you do not need a Strava account to claim possibly the most desirable course record since “Jack Crabtree Sells Avon”. This bid was successful and Sophia, having been denied the honour by a course hiccup two years earlier, finally got her chance to break the tape on the Blues Cross-Country finishing line and add another tankard to her ever expanding collection that already included the full set of podium positions. Last year’s third place finisher Bethanie couldn’t quite match the triathlete’s surprise burst of speed on the home straight but nonetheless pulled out a well-deserved second place to round off a remarkable rise from resident camera-woman-chopper to OUCCC legend and queen of the Varsity tempo. Sealing the podium clean sweep for good was another multisport and cross-country superstar Dani, having the race of her life when it mattered most to double the third place tankard count on the mantelpiece of 46. Helen Record showed maturity well beyond her cross-country years as she closed all the way to the line, claiming sixth place and more than making up for time lost messing around with a Lacrosse stick. With a late surge Captain Helene Greenwood caught one of the three light blues between herself and Helen to claim a brilliant ninth place and verify once and for all that there is no correlation between nail varnish and race day performance. Hannah Plaschkes finished strongly, in her trademark style, ahead of two Cambridge athletes and in eleventh place – a fantastic performance on home turf. Experienced Blue and model Oxford athlete Sarah McCuaig put in a gutsy run to close the seven-strong contingent in fourteenth place. 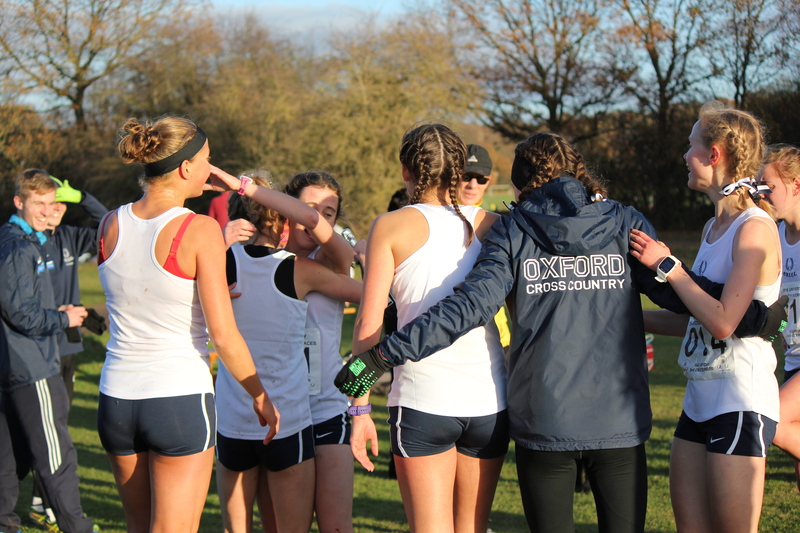 An incredible demonstration of talent and team work from the dark blue girls secured them a historic victory, the first for Oxford since 2011. General hysteria ensued in the finishing area as a mixture of disbelief, excitement, relief and a few happy tears spread across the faces of supporters and athletes alike. This was followed by a champagne shower for Kyle, congratulations from friends and family, lots of smiley photographs, and lots more general hysteria. Credit must go to the Cambridge septet who put up a fight on a course they have dominated in recent years, and will no doubt be back stronger in 2017. Feet firmly back on the ground, it was time to turn attentions to the 126th Gentlemen’s Race. With William Christofi sitting out ahead of international duty, the Oxford boys had recruited Irish hero Eoghan, in the hope that his taste for obnoxiously bright hand-wear might carry him to similar heights as it had his fluorescent-fashion-sense twin and notable absentee from this year’s line-up, the 2015 champion, Mr. Mysterious Unterreiner himself. Back to the race and the boys stayed well bunched for the opening section of the gruelling twelve kilometre battle. By the first passing of the windmill Alex Howard, Jamie Parkinson, Luke Cotter, Eoghan Totten and Luuk Metselaar (dun dun duuuhhh) were all amongst the leading group, with Dan Mulryan, John Spill and Miles Weatherseed looking positive a little further back. Oliver Fox (Cambridge) then pushed on at the front and began to stretch out the field, taking Jamie with him as they rounded the top figure of eight loop, but eventually breaking away. Despite a well-timed, silver medal winning performance from Luke (no doubt inspired by race preview neglect), Cambridge took the victory and should be congratulated for a dominant display of tactics and strength. Varsity is a special concept but it is also a cruel one. Every single one of the Oxford men gave their absolute all and it was a heart-breaking finale for such a close knit team. Hearts and souls were poured onto that course, but the harsh reality of Varsity is that with the ecstatic joy of victory comes the agonising disappointment of loss. Life goes on and so does the Blues after-party. Alcohol was consumed, dinner was enjoyed and speeches were made (yes Helene, you did make your speech, and it was amazing). Luke declared his love for MacGregor and then fell asleep, missing out on the ultimate opportunity to find a nice girl. Helene and DBJ tore up the dancefloor, Miles proved his middle distance speed with a triumphant lap of the rugby fields, and Oxford, in the final tradition of the day, spectacularly lost the boat race. As we stood in the chilly midnight air (or downright arctic if you ask LC) waiting for the coach to collect us, and Dani got on a random bus in search of snow, the curtains were closed on another Michaelmas for OUCCC. 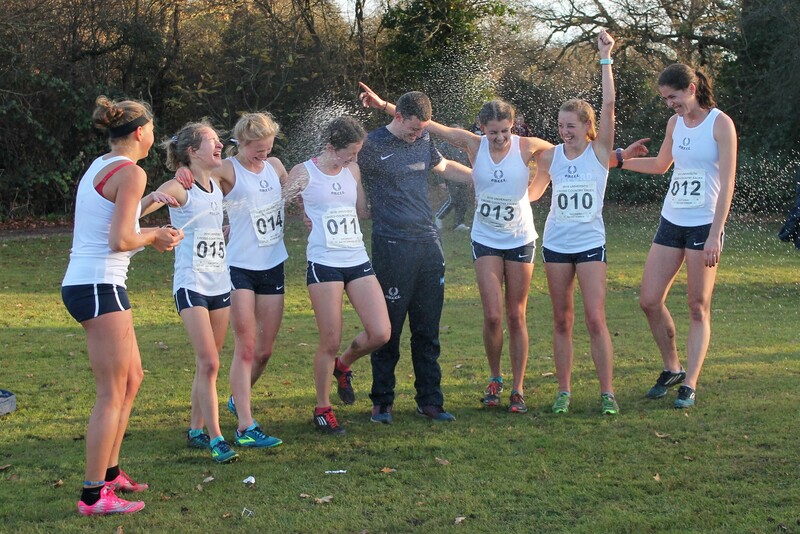 It has been a term to remember for Oxford University Cross-Country Club, and Kyle and the club committee deserve huge thanks for their ongoing support and dedication to a thriving community of athletes, team-mates and friends. See you at BUCS.